A fresh take on the traditional uniform, our shirting collection is available in slim or traditional fit, and customizable in an endless array of colors, patterns and optional details. Our custom restaurant shirt and blouse collection is designed to make a statement. 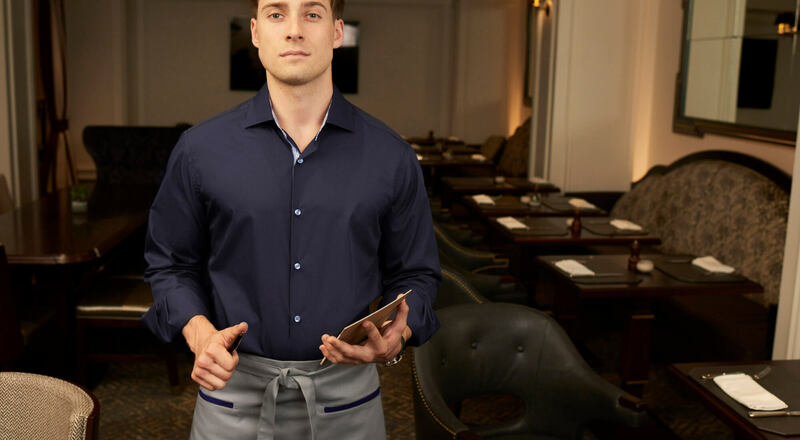 Whether worn alone with an apron, or added to a vest or jacket look, our signature shirting shows an attention to detail that your guests are sure to notice. All of our restaurant server, wait staff and banquet uniforms are custom made to order and manufactured in New York. You select your base styles, and then customize your garments by choosing your own color, fabric, trim, embroidery and more- the options are endless. We have very small minimums of 12 pieces per style, we make every size, and we never discontinue your patterns.